Kids Bible Bookshelf is an interactive — you guessed it — bookshelf for your iOS device. 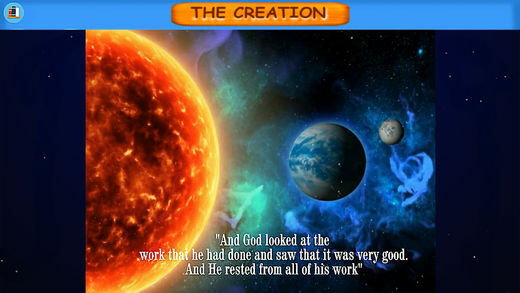 The app is free to download, and comes with one built in book – “The Creation.” It’s a great idea that isn’t perfectly executed, but still offers enough of merit that I’d recommend it for children who want a little more interactivity to go along with their reading. The book itself has two options — read to me, and read by myself. Choose the former, and the book will be narrated to you, Audible style, with read-along subtitles displayed at the bottom of the screen. Choose the latter, and the subtitles will remain, but the narration will disappear. At various points throughout the story, you will be encouraged to interact with specific elements. Often, a simple tap will advance you to the next page. Other times, you’ll be tapping animals to get them to make their signature noise — the roaring lion, for example. 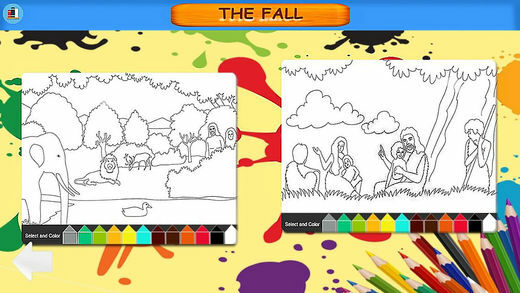 The last page has you colouring in two pictures from earlier in the story – meaning if you really want blue trees, orange sky and brown grass, there is absolutely nothing to stop you. While basic, I appreciated these sections for attempting to get kids more engaged in the subject matter. 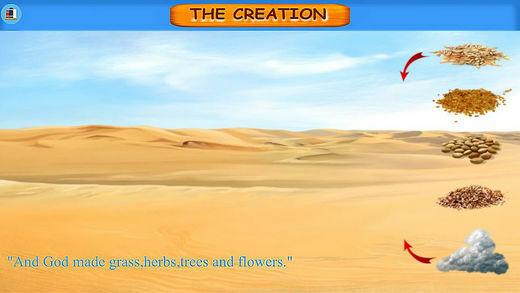 “The Creation” may not be the most exciting subject for young children, but Kids Bible Bookshelf encourages them to take an interest in it, in a simple manner that’s befitting of its young target audience. The way the app is laid out isn’t as visually appealing as I would have hoped, especially considering the awe-inspiring nature of the story. The various pictures that pop up with the text all look great, and differ enough from each other to frequently keep things looking interesting. Sadly, I thought this was hindered slightly by the black bars at either side of the image. It took my attention away from what was going on, and I can’t help but wonder why the pictures don’t fill the entire screen. Also, sometimes the subtitles clashed with the background, making them difficult to read. Kids Bible Bookshelf doesn’t feature any tutorials — and that’s because it doesn’t need any. The first thing you see when you load it up is your bookshelf. Click on any book, and it will launch. While reading, tap the bookshelf icon to return to the menu. It’s simple and easy to understand, essential requirements for an app aimed at children. There was never a point where I became stuck, frustrated or unsure what to do. It all just works. Interactive stories are a wonderful way to engage people in books that they otherwise might not be interested in. Kids Bible Bookshelf is a simple, easy to use attempt at such a story, that I’d recommend for youngsters that may be looking to access this material for the first time. TESTED ON: IPHONE 6S, IOS 9.2. KIDS BIBLE BOOKSHELF ON IOS REQUIRES IOS 7.1 OR LATER. COMPATIBLE WITH IPHONE, IPAD AND IPOD TOUCH. THIS IS AN EXPEDITED SPONSORED REVIEW. SUBMIT YOUR APP FOR REVIEW HERE.